The geo map doesn't work in oracle. We can create a geoarticle with no problem (when we click an address and click on "find adress", the address is correcly displayed). But when we verify the address in frontpage of eZ Flow, after adding a "Google Map Items", the map is in a differently position. Similar behaviour as in http://issues.ez.no/17683. Add block "Google Map Items"
Currently, in ezp5, it's not working again. Following the steps described above, i have a map without the coordenated specified. 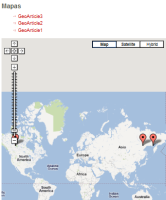 so it seems that the geopoints are not being generated. Moving issue back to Backlog as it is not actively in development. André Rømcke added a comment - 11/Oct/12 12:17 PM Moving issue back to Backlog as it is not actively in development. In the current build, using Oracle on Legacy (https://confluence.ez.no/pages/viewpage.action?pageId=2720338), this error no longer occur. In the current conditions, using Oracle on LS (https://confluence.ez.no/pages/viewpage.action?pageId=2720338), the error no longer occur. Paulo Nunes (Inactive) added a comment - 31/Oct/12 12:46 PM In the current conditions, using Oracle on LS ( https://confluence.ez.no/pages/viewpage.action?pageId=2720338 ), the error no longer occur.